* Thanks to Sam Donaldson who gave Stuart Jackson and me a tour of 85 Park Place. Thanks Stuart for including me. * What our modernist designers do best, they did here: Walls of windows and a soaring atrium that slashes tall and deep into the building "bringing" the sunlight. * Interior windows light interior rooms so claustrophobics can be somewhat at ease. * Open spaces mean you'll see your fellow students and teachers and they will see you right back. * A monumental floating stairway "brings" the diagonals. * Two words: terrazzo floors. * There aren't any cultural symbols inside 85 Park Place. I just can't imagine portraits of judges or alumni, certainly no Moses in there. Wouldn't it would ruin the minimalist effect? * Attention artists: Y'all could do something bodacious in here. Please do. 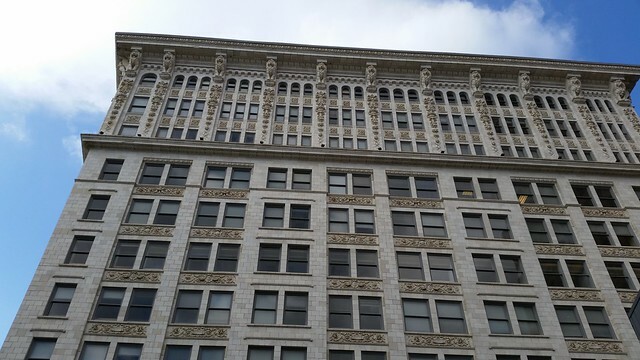 * Fortunately the blandness of the finishes, the soaring atrium, hallway enfilades and glorious windows take the eye outside towards the Candler Building, the Flatiron and the Carnegie Buildings. * And you can go outside on the decks while you are inside. 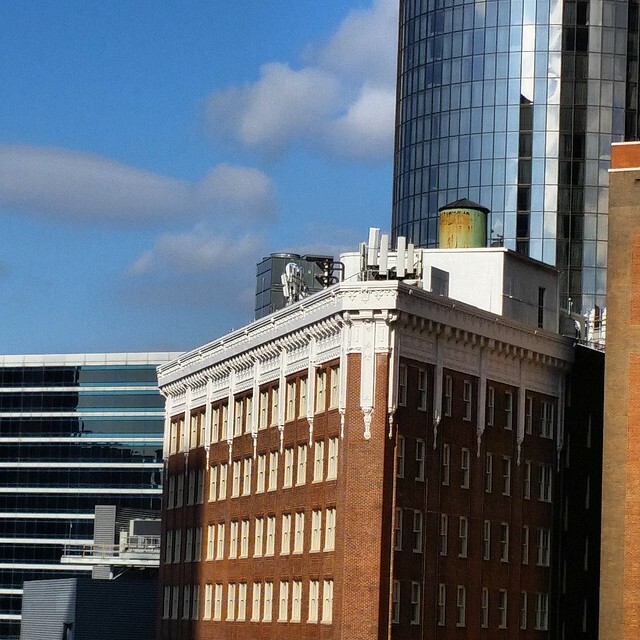 * I didn't know there was a water tower atop the Carnegie. * I was too busy looking outside to capture the inside but I did take a couple of videos. *Here's one from a stairway landing, I even caught the street car. This feels BIG CITY. * And another from higher up. * You are probably wondering if I like it. 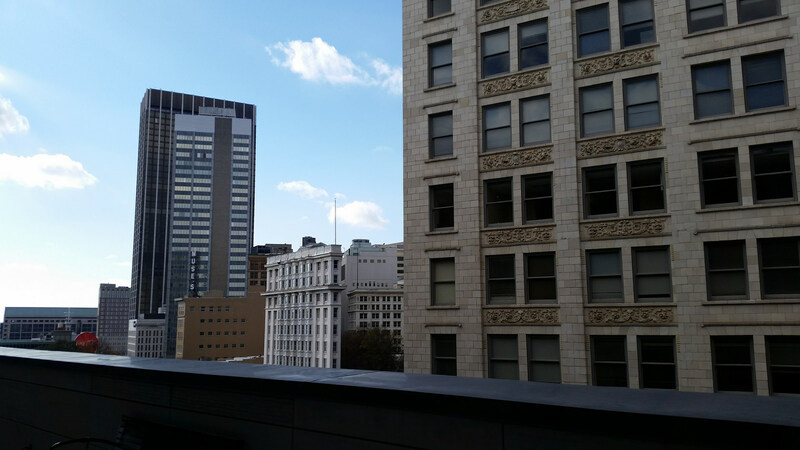 Would I enjoy going to school in a brand new building with a view and elevated decks? Well yeah. Thanks Sam and Stuart. I drove Peachtree Road yesterday and as usual nobody looked happy, not even the folks driving 50. "Right now Peachtree Road is a highway, our most famous street is a lifeless, un-fun bore with some IMPORTANT looking buildings, and I don't feel safe driving on it." - me on Facebook. 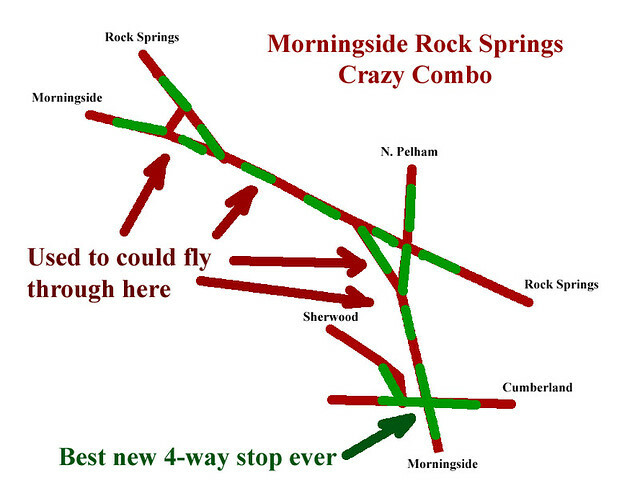 I'm ready for a change and that change is "re-striping Peachtree." But I don't think we're going to get it. 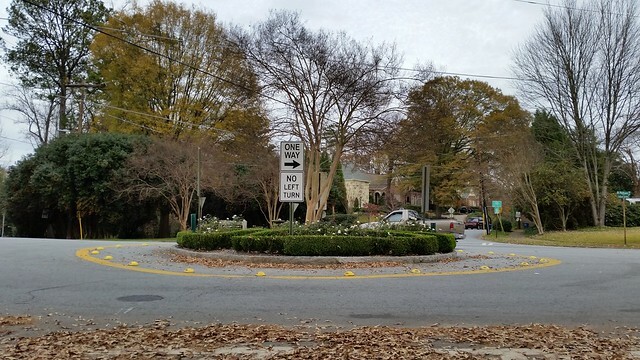 Traffic calming on Peachtree means reducing lanes. Intuition says that would slow traffic at least that's what my intuition said. But as with so many things in my life, I've changed my mind. 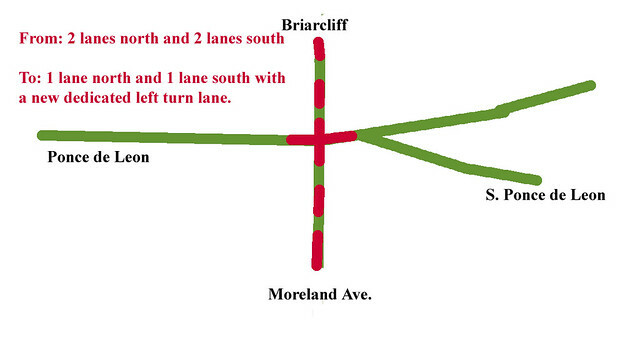 Here are some "traffic calming" projects that have improved my life. This is Emory University's front door. They spent a bunch on the hardscape - it's Druid Hills after all - but they got it right. Used to be four lanes all the way on North Decatur with a giant intersection. You could go 50 though there if you caught the light right. Now it's just two lanes and we seem to zip right through. 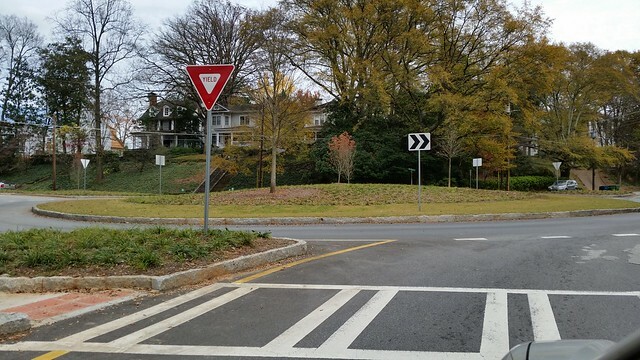 Emory students actually use the crosswalks which were formerly "cross-runs-for-you-lives." This was a busy place with irritating, dangerous, unpredictable left turns onto Ponce. They removed two lanes and added a dedicated left turn lane. They just changed the stripes. It's still a busy place but now left turns are relatively dreamy. Bravo to the engineers. It was an adrenaline surge zone in my family's neighborhood. Two wide streets combined into a Formula One chicane and you could just fly while you rubbernecked over your shoulder. Now it's civilized and I don't miss the speed. 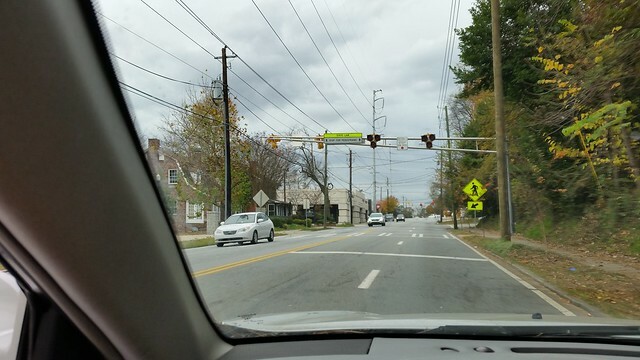 You have to wait at the Piedmont or Highland stoplights anyway. But it wasn't perfect until they added the "best 4-way stop sight ever," which made my Kroger runs into pleasure rides. BeltLine interference that slows folks down and gets them home just as quick. One pedestrian can push the botton and stop traffic in midblock. Preposterous! Yet instead of stopping once for a long time, you might stop twice for a shorter time while calming the Monroe Drive drag strip. 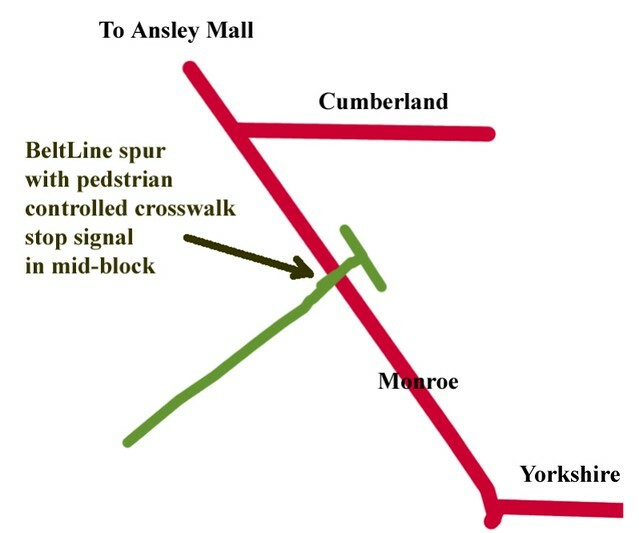 My Kroger runs require a right turn from Cumberland to Monroe. Now it's civilized. Here's a picture approaching the crosswalk from the south. Ansley Park's new pitchers mound is thing all to itself. 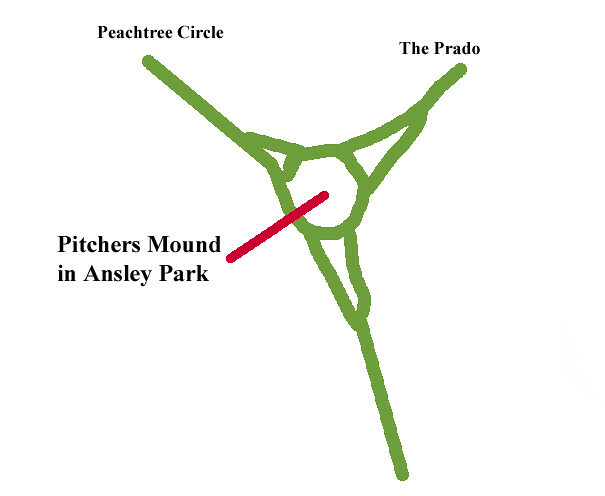 A circle on Ansley's giant streets must have been spiritual experience for the engineers. Unexpected soil and utility issues must have been a spiritual experience for budgeteers. Ansley has many more too-big intersections. I hope their circles are on hold. 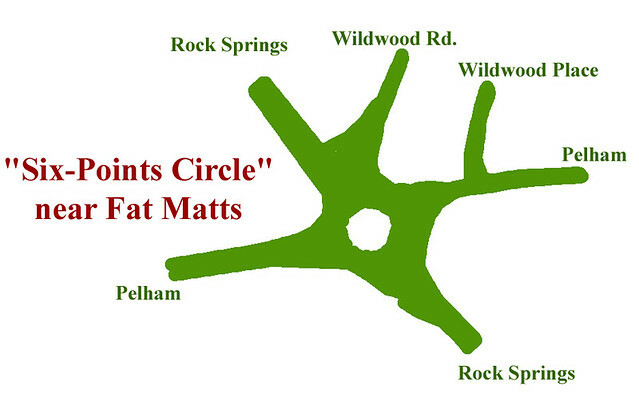 I think they ran out of money before they got the Fatt Matt Circle just right. Though it slows folks down a bit, folks just don't know how to use it. After a little experience a circle is obvious. This one isn't. The hardscape is too small giving drivers too much leeway. It's needs to be scaled like the Pitchers Mound. The landscaping is pretty though. More later. Ponce de Leon is a whole 'nother traffic calming thing - which I mostly favor.